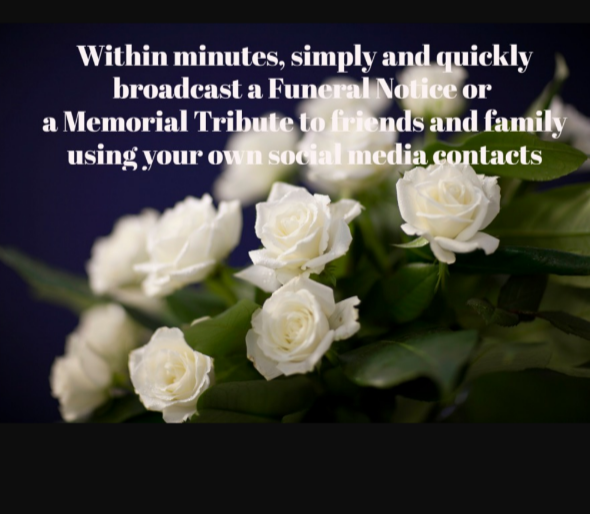 Within minutes, simply and quickly broadcast a preformatted text infographics Funeral Notice (PDF) to friends and family using your own social media contacts. Death of a loved one can unleash stress and an overwhelming sense of responsibility, especially if you have to convey news of the death to your friends and extended family, calling each of them " explaining when, how and why". Submitting a death, funeral notice or a memorial tribute to a newspaper, takes time and can be costly. Sending short text messaging (SMS) can often lead to typos or discrepancies. We understand this stress. That's why we created this service, to help bereaved or funeral homes relay the news with a simple and quick broadcast via Whatsapp, Twitter or any social media, using our preformatted text and infographics, with just a few clicks.